More pictures are coming, for some reason I cannot get any more photos to show. Last look back we looked at the Kennywood opening day and the wonderful retrack work they did on their wooden coasters. Today we will look at Cedar Point's opening day in which, in the style of B&M coasters, it was ready for day 1. Despite the cloudy, dreary day, that actually stayed rain free until the last two hours of the day, people showed up in droves to ride the new ride and tons of other offerings the park has. A band was even there, it was great! There were many improvements all around in the park as well. The front entrance plaza was completely rebuilt from the ground up. The entire front midway area that Gateway occupies, all the way to Wicked Twister, were completely changed around/ reconfigured with the games midway that was newly built a few years ago now being in place with a totally new looking midway. I would imagine they had a project similar to this in mind when they undertook that project. This was likely the long term plan to have something fill the front of the park like this once they removed the old favorite Demon Drop a few years ago and built the new and improved games. 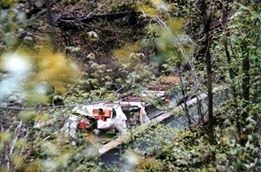 Sadly this also involved the removal of old favorites Avalanche Run/Disaster Transport Intamin Bobsled Coaster and Space Spiral Intamin Observation Tower. They were removed to create the highest capacity roller coaster in the park, something desperately needed after the addition of the thrilling, yet inefficient Maverick. Here you can see some of the differences from pre-removal of Demon Drop, Space Spiral and Disaster Transport. Trade offs, trade offs. It would have been cool to see Gatekeeper circle around both Demon Drop and Space Spiral similar to Gold Striker at Great America or Tatsu at Magic Mountain. Both Demon Drop would have either needed removal or major refurbishment done to them. Demon Drop was easily a better candidate for the latter and Space Spiral for the former, but hey, it is probably a part of that Chevy Cruze that you drive that is made nearby. Always sad to see classics go, but that is progress. If you loved Demon Drop, or any of those wonderful first generation Intamin drop towers, get to Dorney Park. I feel this is the best feeling of true free fall, true zero gravity. The view from the top of it at Dorney is also spectacular. Keeper of the gate, beautiful! Back to the Point, as soon as you enter the park you are greeted by screaming riders in a zero g roll right over your head, creating one of the most dramatic entrances into any park. Anticipating capacity needs and also with new CEO Ouimet and Decker playing a pivotal role in this project, along with the highly anticipated Banshee project, they are working to improve areas they felt needed attention across the park. They are also awesome guys I had the opportunity to talk with on the midway that day in the midst of watching the fruit of their and their team's efforts on the massive undertaking. They are great guys and under their leadership the parks should continue to improve and flourish. 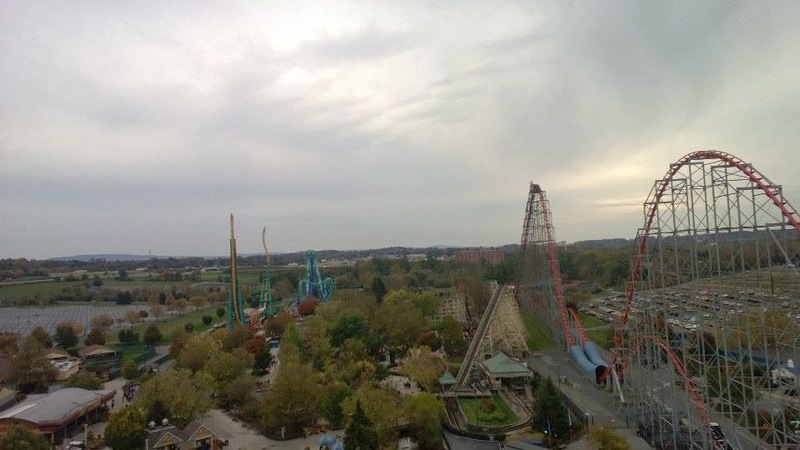 Among these areas they have worked to improve are the midways, doing major retracking and improvement projects on Blue Streak and also Mean Streak. My first visit to the park was in 2003, and I always tolerated Mean Streak, but it was by no means a comfy ride. When we visited the park in 2010 (I believe) the ride was really bad, to the point that opted not to ride it. The ride was smooth as butter this season, and was even better on our second visit to the park in June. It rode perfectly and was an enjoyable ride for the first time ever for me. That week I had also tweaked my back and I think it tweaked it back into place on that curve heading towards the MCBR. Blue Streak was boss this year! Blue Streak was the real star of the show though, with so much work done on it in the offseason, it really shined. This is one of those rides that every time seems different on it. On opening day, the air was extreme ejector, which is always fantastic with those wonderful PTC buzzbars, the best lapbars ever made. There was even more new track on this classic due to a crane falling on it about a week or two before opening. The trains were also new as of last year I believe. Rebbie and PTC never fail to bring a great product with their trains and Blue Streak's trains are no exception to this. Cedar Fair and Cedar Point's leadership have made sure this coaster is well taken care of. In addition to this, they undertook a massive project to repaint Millennium Force and as always, they delivered. The original paint was extremely faded and looked pretty bad, but thanks the great company wide repainting plan, the best in the industry, the track looks fantastic now, just as they did a wonderful job on Magnum and Corkscrew along with Talon and Steel Force at Dorney. Two years out on Steel Force and it still looks the paint is brand new. Almost all parks in the industry collectively need to follow suit, especially Six Flags. The SF plan to create New Paint: The Ride with the Bizzaros was nice, but they need to keep up on paint all around. Look to the Cedar Fair parks for a nice example. As always, Millennium, Dragster, Magnum, Raptor and others delivered, no need to talk about that. Cedar Point is a fantastic park with fantastic rides and more. The CP&LE Railroad is a relaxing break from coasters while also providing for a nice buffer between a Famous Dave's BBQ Lunch, although watching Millennium eating is lots of fun! Overall, the opening day was lots of fun, even with getting rained out at the end. We rode the Cedar Downs, the wonderful classic, one of only two remaining racing carousels, with the other remaining at Rye Playland and then we played some games in the classic ballroom arcade. The end result was getting two cool Coaster Dynamics models, one of a Dragster train and another of a Maverick train. Getting two opening days, two weeks in a row, was lots of fun. There is a special energy in a park on opening day. Ride ops are getting some of their first laps in, rides are breaking in and everyone is excited for the upcoming summer. It was especially exciting to see a great new ride in Gatekeeper open up with the park. Gatekeeper welcomes you with a real cool energy as soon as you enter. It really sets the tone. You can see the rest of the photos from the trip in these two albums, my album and Brit's album. Something told me to take the photo on the left. We live in Pittsburgh and were visiting my family from Allentown. We took a day to go to the shore. Something told me to take a photo of that scene, it was just so beautiful. Just two months later, the first shot of the Seaside damage came in and it matched up perfectly with the perspective. Devastating. A year ago, I recall sitting panicked, worrying and making sure everyone and everything would be alright after the storm. Thankfully everyone was physically alright. Sadly, many family businesses and lives were uprooted as a final result of the storm. As I always say though, things can always get worse. This was the start of the Seaside of my childhood going away. 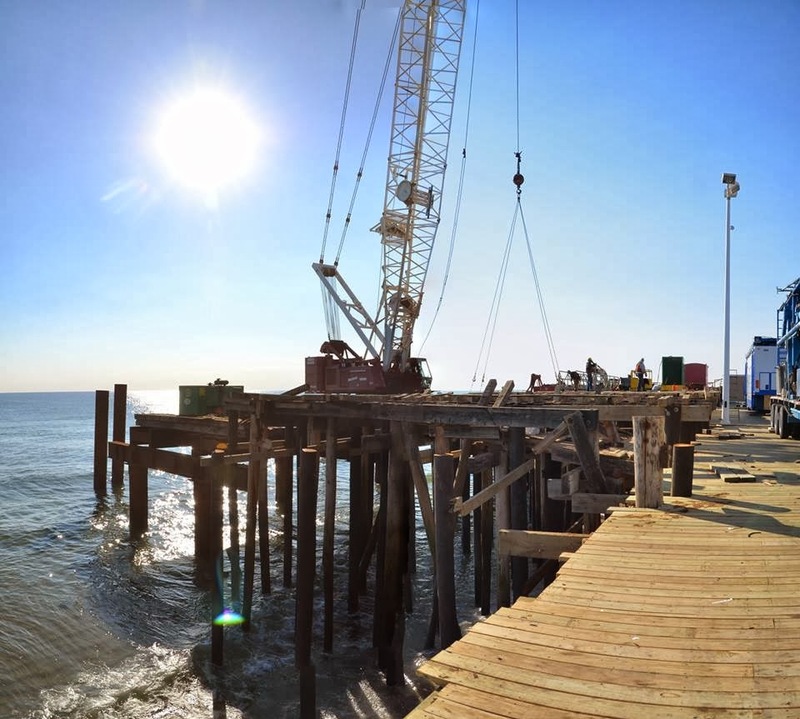 The fire this past fall took away everything but the heart of the Seaside Boardwalk, Lucky Leo's and the Casino Pier Carousel. I look forward to seeing a bigger and better Seaside, but I will always remember visiting that August and taking things in for some reason. I took extra care to take note of everything. I just sat on benches in several places and just took stuff in. 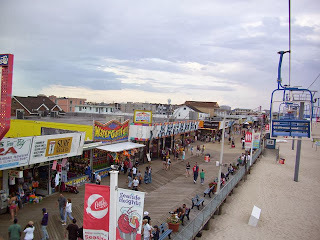 We walked to the end of the boardwalk and took in the shore next to the old Funtown Pier. All of these things are gone, but the heart is still there. Things will be better and the efforts made to improve since then have been wonderful. Casino Pier is in the midst of being fully taken down and rebuilt and action is happening all around. We are fortunate that the fire as a result of storm damage this past fall happened then as opposed to during the summer with a jam packed boardwalk. Things are looking up now. I hope to one day see this, the Seaside of my childhood be restored! The future is bright and I cannot wait to see the end result of all of this rebuilding. The shore needs our support though! Casino Pier and Lucky Leo's both have events that go on throughout the year. Go down to the Jersey Shore and have some fun! Autumn and Winter visits to the shore are fun. Once the spring and summer come, go down and play some games at the arcades (do that now too) and support the shore. You will have a blast and also help the rebuilding continue. Our first park trip of the season was for opening day of Kennywood. The visit was spectacular! We were in an event run by our club, Great Ohio Coaster Club, and it was amazing. We were given a personal tour of the park and history lesson by Kennywood's Andy Quinn, a lifelong man at the park, with his family being part of the ownership of the park for a century. He gave us a wonderful tour of the entire park and we were also given an up close look at the Racer, from the ride's infield, giving us a once in a lifetime view of this cathedral of wood. The park really did some wonderful retracking work on all of the wood coasters. The Racer, Jack Rabbit and especially the Jack Rabbit ran superb for the entire 2014 season. They even rebuilt sections of the lift hills on both the Racer and the Thunderbolt. The latter also had the majority of the track on the both large helix hills near the midway. The NAD trains on Thunderbolt ran like a dream and with how spectacular this ride is at any time, it ran that much better, if you can even imagine that. Jack Rabbit is always a favorite and that rode like a dream as well. They really took great care to improve the ride experiences on all three coasters. They ran the best I have ever rode them and really broke in even better later in the season. They rode great in 2012 as well, but I thought they could use some love. They took great care to restore them. Brit really enjoyed the Auto Race, as did I. Such a fantastic gem of an old, one of a kind, classic. It was a great day as always at Kennywood. Nothing out there is quite like visiting Kennywood, a truly one of a kind park and I am glad it was the first park of the year for us. I wanted to start a blog where I can write some of my thoughts, add content, continue discussion and more without limits. It is wonderful to see all of us coming together on our Facebook page to discuss coasters. It is great to see the joy everyone has for the topic. Roller coasters are our great uniter. We have folks from so many backgrounds, whether it be from different parts of the U.S. different views on things, different backgrounds and even different countries. It is great to see all of us come together to discuss stuff that we love. We do not have to be limited to talking about roller coasters, we can also talk about the cool, different things that we do in travel, or maybe even in our hometowns. Maybe you visited a cool historical monument or tourist destination? We can talk about anything and everything.